President Trump could be bad news for solar. But this news could be worse. It hasn't been easy to be a solar power investor these past few days -- or weeks. 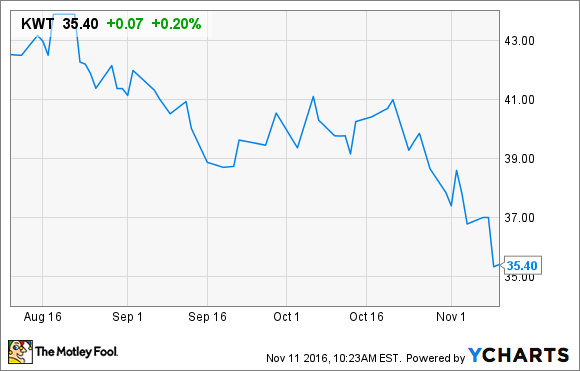 After touching a recent high of $41, the Market Vectors Solar Energy ETF (NYSEMKT:KWT) sold off steadily heading into the U.S. presidential election on Nov. 8. It promptly plunged again when it was learned that climate change opponent Hillary Clinton would not become president, while global warming skeptic Donald Trump will. And today, yet another shoe dropped on the toes of solar investors, when ace stock investor UBS (CAPS rating: 92.77) announced it is canceling its buy rating on shares of solar system seller SunPower (NASDAQ:SPWR) and downgrading the stock to neutral. Fall 2016 has not been kind to solar investors. KWT data by YCharts. UBS' downgrade from buy to just hold sounds like a rather modest reversal for SunPower investors, but in fact, it's a whole lot more drastic than it sounds. You see, previously, UBS believed that SunPower shares were so undervalued that they would rise as high as $13 -- more than doubling off of today's share price of $6.15. But in removing its buy rating, UBS also cut its price target pretty drastically -- from $13 to just $7 a share. In so doing, it swept away the promise of a 100%-plus profit for SunPower stockholders, replacing that with a prediction of less than a 14% gain. But did UBS really have a choice? In a write-up on StreetInsider.com this morning, UBS explains its reason for downgrading SunPower stock and trashing its target price: "Despite our initial thesis that shares were close to a near-trough valuation, multiple guidance revisions in the space of several months" necessitated this downgrade. Whereas just three months ago, SunPower was telling investors to expect sales of as much as $3 billion in 2016, the company's new guidance issued Wednesday cut that to a range of from "$2.43 billion to $2.63 billion," with net losses now estimated at "$295 million to $320 million." These losses will probably continue into 2017, and may even grow. SunPower used to say it expected to lose "$200 million to $100 million" in fiscal 2017, but the company retracted that guidance in its earnings report Wednesday, warning that "previously issued 2017 guidance should no longer be considered current" and saying it would not give new guidance before "December." What lies at the heart, then, of both SunPower's downward revisions to guidance, and UBS's downward revision to its rating on SunPower stock? UBS explains that the marketplace for solar equipment is "extremely challenging," and to the extent "that even the highest quality product in a commodity space" is likely to experience margin contraction. Indeed, it could be worse than this. UBS worries that "lower panel prices" overall could have a "knock on effect on ability to sell at SPWR's historically premium prices." Thus, SunPower's "DG margins could still deteriorate" further, and the losses that SunPower last warned us about could be even worse than we fear. So where does this leave investors today? Currently, SunPower stock is unprofitable. The positive "forward P/E" multiple reflected on Yahoo! Finance implies that analysts are hoping things will improve in the year to come -- but in fact, say both SunPower and UBS, 2017 earnings are likely to be negative again. Meanwhile, according to analysts surveyed on S&P Global Market Intelligence, the consensus on Wall Street today is that SunPower won't earn its next GAAP profit before 2018 -- if then. It all adds up to a pretty bleak picture for SunPower investors. In fact, if you ask me, with UBS only downgrading the stock to neutral, and not all the way to sell, SunPower stock may be getting off easy this time.